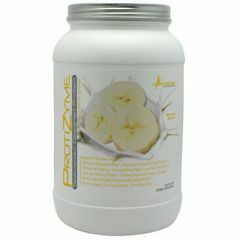 AllegroMedical.com presents The Metabolic Nutrition Protizyme - Banana Creme Protein Supplement Gluten Free. Specialized Designed Protein. Pharmaceutical Grade. Superior to Other Proteins. Delicious Gourmet Flavor-Satisfies Hunger & Food Cravings. Perfect for Dieting-Low Carbohydrates, Low Fat, Low Calories. Fast and Easy to Digest-Potent Digestive Enzyme Complex. Builds Lean Muscle & Accelerates Metabolism. Zero Lactose, Zero Aspartame, Zero Trans Fat. Protizme is ideal for any consumer who demands superior quality, uncompromising results, and is looking to increase lean muscle mass, boost metabolism, improve health/wellness and maximize physical enhancement, guaranteed! Dedicated to manufacturing high quality nutritional supplements, backed by scientific research and formulated by a medical doctor, Metabolic Nutrition was the first to introduce a specialized designed protein to the marketplace-Protizyme. Acclaimed by physicians, athletes and consumers alike, Protizyme's premium pharmaceutical grade engineered protein increases protein absorption more than 300%! In scientific terms, the secret lies within the unique manufacturing process of Protizyme, which differentiates from all other regular proteins in the marketplace. Protizyme's 10x ultra-microfiltered process preserves the essential protein-peptide structure which delivers greater concentrations of amino acids, glutamine and BCAA's. Each gram of protein in Protizyme is coated with only the most potent digestive enzymes, dramatically increasing digestion and absorption, therefore eliminating gas and bloating. Protizyme is fortified with 24 essential vitamins and minerals, providing optimal nutritional benefit absent in other proteins. Additionally, Protizyme contains the highest levels of bioactive protein fractions and immunoglobulins to improve immune function, support intestinal health and promote a greater sense of well being. Lastly, Protiyzyme exclusively contains the ultra-powerful ingredient. TAG (Trans-Alanyl-Glutamine), the world's only "Muscle Targeted Glutamine", which boosts your body's rate for muscle recovery and repair by over 425%! What does this mean to you? It means you can absorb more protein per meal, 50, 60, or 70 grams or more, doubling your daily protein intake without the common gas, bloating, and upset stomach. More protein absorption means increased protein synthesis, thus faster results than other regular proteins! Protizyme increases protein absorption, muscle recovery, aids in fat weight loss, prolongs, physical stamina, boosts immune systems, maximizes nutrient utilization and stimulates muscle production greater than any other protein, making it a critical supplement. Protizyme is suitable for all: low-carbohydrate, low-fat, low-glycemic, reduced calorie, gluten free and diabetic diets, as well as, a good food supplement for Bariatric or post surgical patients. A proprietary blend of Ultra 10x-microfiltered enzymatically hi-absorption whey protein isolate and whey protein concentrate (containing highest levels of bio-active immunoglobulins. Beta-lactoglobulin (55%-65%). Alpha-lactalabumin (18%-25%), Immunoglobulin (9%-12%), Bovine Serum Albumin (6%-10%), lactoferrin (1%-1.5%), T.A.G. (Trans-Alanyl-Glutamine). Maximum Potency Digestive Enzyme Complex (comprising of Amylase, Protease, Cellulase, Galactohydrolase, lactase, Lipase, Betaine, pepsin, and Papain), Vitamin Mineral Blend (consisting of Ascorbic Acid, Beta Carotene, Biotin, d-Calcium Pantothenate, Folic Acid, Niacinamide, Pyridoxine Hydrochloride, Riboflavin, Thiamine Mononitrate, Vitamin A Palmitate, Cyanocobalamin, Cholecalciferol, Tocopheryl, Magnesium Oxide, Manganese Sulfate, Molybdenum, Dipotassium & Dicalcium Phosphate, Potassium Iodide, Selenium, Zinc Oxide), Xanthan Gum, Guar Gum, Natural and Artificial Flavors, Sucralose.